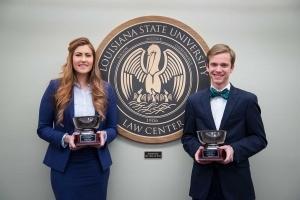 LSU Law students Erin Abrams and Justin DiCharia won the Spring 2018 Ira S. Flory Mock Trial Competition on March 6. Chaz Coleman and Leah Voth finished runners-up in the internal trial competition. Abrams and DiCharia represented the plaintiff against the defense team of Coleman and Voth.